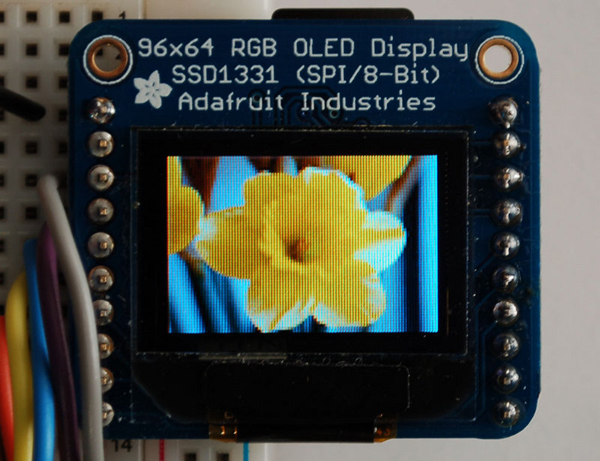 Updated Tutorial: 0.96″ mini Color OLED @ Adafruit Learning System « Adafruit Industries – Makers, hackers, artists, designers and engineers! Our 0.96″ color OLED displays are perfect when you need an ultra-small display with vivid, high-contrast 16-bit color. The visible portion of the OLED measures 0.96″ diagonal and contains 96×64 RGB pixels, each one made of red, green and blue OLEDs. Each pixel can be set with 16-bits of resolution for a large range of colors. Because the display uses OLEDs, there is no backlight, and the contrast is very high (black is really black). We picked this display for its excellent color, this is the nicest mini OLED we could find. This guide will show you how to hook it up and use it with an Arduino.